Who doesn’t love snacks?! And even better, what about a box delivered to your house each month filled with candy and snacks from all over the world?!! Our family loves trying new foods so we are big fans of the MunchPak subscription box. Boxes can be ordered with 5+, 10+ or 20+ snacks and can be delivered every two weeks or every month. Depending on the size of the box subscriptions start at just $9.95/month. Each box contains a variety of snacks and candy from different countries around the world. These are full-size candy bars, snack-size bags of crunchy, salty, snacks and more. I like that each snack item has a sticker with a short description of the snack, as well as what country it is from. 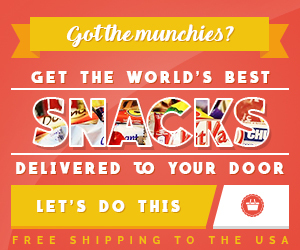 If you discover a snack that you really like, you can order more from the MunchPak website. Check out MunchPak and get started on starting your subscription! Pocky: Winter Melty (Japan) – Pocky are chocolate covered biscuit (cookie) sticks. This is not a new-to-us snack, as we’ve received Pocky in previous MunchPak boxes. However, we had never tried this Winter Melty variety before. The biscuits are covered in layers of white chocolate and cocoa chocolate cream. Ulker Cokomel: Strawberry Marshmallows (Turkey) – This cookie reminded me of Mallomars in looks. Except this had a strawberry flavored marshmallow filling. The package contained six cookies, which was plenty for sharing. UHA Mikauto Puchao: Ramune (Japan) – This was another snack from Japan. For those not familiar, ramune is a Japanese, carbonated soft drink that comes in many different flavors. Each candy is individually wrapped and is chewy with tiny gelatinous like balls. My son loved these! Cheetos: Bolitas (Mexico) – These tasted like the Cheetos we are all familiar with less of a cheese taste and more of a slightly, spicy kick. Reptar On Ice (USA) – They placed the info sticker over the part of the wrapper that has the Nickelodeon Rugrats images. It appears that “Reptar on Ice” was an episode of the Nickelodeon cartoon. This was a chocolate bar filled with blue icing that is supposed to turn your tongue blue (which it does). Although I’ve seen a few Rugrats episodes, I was unfamiliar with this particular episode. Oppenheimer: Chik Chak Hot & Spicy (Israel) – This bag was filled with tiny, crunchy cubes. I didn’t find these to be too spicy and thought they could actually use a little more flavor. Vidal Gummi Snowmen (Spain) – Our family loves gummi candy. These snowmen came in strawberry and apple flavors. Toxic Waste Nuclear Fusion Sour Candy (Pakistan) – This bag contains five different flavored, individually-wrapped candies (raspberry lemon, pineapple and passion fruit, banana and blueberry, orange and apple and grape and strawberry. When I tried this candy I had to spit it out after 15 seconds. It was way too sour. However, the rest of my family have more tolerable taste buds and after a bit told me that the extreme sourness goes away. Avery’s Kitty Piddle Soda (USA) – You can add a drink to your box for an additional $5. Just the name of this Avery’s “Totally Gross Soda” did not make me want to drink it. Kitty Piddle is supposed to have flavors of pineapple and orange. Both my daughter and I thought it had a “woody” aftertaste. None of us were fans of this drink. MunchPak is a fun monthly subscription box that the entire family can enjoy together. Or, it makes a great gift for any snack-loving friends or family! Omg my husband would LOVE this! I’m totally going to get him this for his birthday.